It's an upscale resort, designed with families in mind. 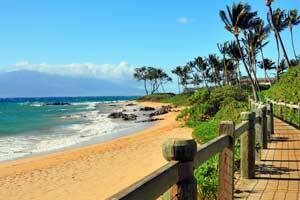 You've got two of Maui's best beaches - Wailea and Keawakapu on either side. Hit the gym for weights and cardio on some fine machines. All condos feature private outdoor grills and open-air dining areas. The gorgeous pool will have you dreaming of your last vacation for a long time. This luxury resort really sets the mood for a romantic vacation. All you'll hear is the gentle churn of the Pacific. Wailea Beach Villas, A Destination Luxury Hotel gives you the luxury of a Ritz or Four Seasons, but without the crowds, in a private, peaceful environment. You’re ideally located, not only with direct access to Wailea Beach, but you’re next door to the designer boutiques of the Shops at Wailea. Make a pit stop at your condo to get changed into swimsuits – don’t bother unpacking, there's time for that later – spray everyone head-to-toe in sunblock and get ready for some fun in the sun. Spend the day at the beach, go for a swim in the adult pool or lounge poolside with the latest issue of People magazine while the little ones splash around in the children’s pool. The well-equipped fitness center overlooks the pool. Feel the burn while you enjoy the view. With all of this, it’s no wonder that the resort has a 5.0 Rating on TripAdvisor! Ultra-lavish individually furnished & decorated one- to three-bedroom condos sleep two to eight guests and come with stunning gourmet kitchens (bring the kids along to Safeway for groceries). Get in touch with your inner chef and make your famous lasagna, or have a family cookout. Grab condiments, plates and utensils and let the kids carry burgers, sides and hot dogs out to the private lanai, it has a Viking BBQ grill. In-suite washer/dryers allow you to pack light (more space for souvenirs!) and daily housekeeping keeps each condo spotless. The resort offers in-suite spa treatments, reward yourself with a massage for your vacation planning skills. Feel like having a low-key night in? You’re in luck! Your condo has Cable TVs that are perfect for catching the big game or a sitcom rerun. Or bring favorite movies from home to watch on your DVD player. Pop some popcorn, call everyone into the living room and get ready for family movie night. Wailea Beach Villas, A Destination Luxury Hotel offers a private entrance to The Shops at Wailea. Get started on filling that extra space in your suitcase; there are over seventy stores that range from high-end to more affordable options. High-end brands include Tiffany & Co, Louis Vuitton and Prada. If you’re looking for more affordable options, check out GAP, Quicksilver and Billabong. Get an Iced Blended at The Coffee Bean; it’s a perfect afternoon pick-me-up. When you get hungry, try Ruth’s Chris Steakhouse or The Cheeseburger Grille & Tap Room. Golfers will love the Wailea Blue Golf Course. This eighteen-hole, Arthur Jack Snyder-designed course is Wailea’s original golf course. It has both a pro shop and a clubhouse. from the Wailea Gateway Center, take Wailea Ike Drive to the stop light at the Shops at Wailea, turn left and take the second right to the security gate at Wailea Beach Villas. Here, you will receive room keys and directions to your resort. Please contact the office using the information on the reservation confirmation received after booking. During renovations, the condo resort will make every effort to minimize noise and disturbance. Cribs (infant beds) are available for USD 20 per night. The most luxurious Maui destination, Wailea boasts world-class resorts, fine dining, and an idyllic beach walk. It's also one of the sunniest places on the island, protected from the rain by the peaks of Mt. Haleakala.